Discover what makes this Christian private school in Silicon Valley stand out from all the others. The King’s Academy is an independent, college preparatory school for grades 6-12 which exists to honor and glorify our King Jesus Christ. 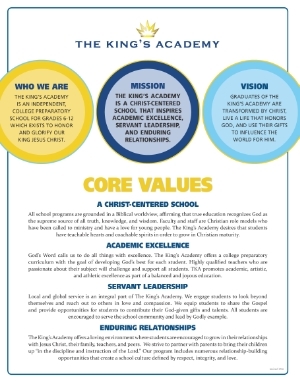 The King’s Academy is a Christ-centered school that inspires academic excellence, servant leadership, and enduring relationships. Graduates of The King’s Academy are transformed by Christ, live a life that honors God, and use their gifts to influence the world for Him. All school programs are grounded in a Biblical worldview, affirming that true education recognizes God as the supreme source of all truth, knowledge, and wisdom. Faculty and staff are Christian role models who have been called to ministry and have a love for young people. The King’s Academy desires that students have teachable hearts and coachable spirits in order to grow in Christian maturity. God’s Word calls us to do all things with excellence. The King’s Academy offers a college preparatory curriculum with the goal of developing God’s best for each student. Highly qualified teachers who are passionate about their subject will challenge and support all students. TKA promotes academic, artistic, and athletic excellence as part of a balanced and joyous education. Local and global service is an integral part of The King’s Academy. We engage students to look beyond themselves and reach out to others in love and compassion. We equip students to share the Gospel and provide opportunities for students to contribute their God-given gifts and talents. 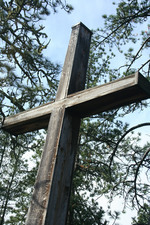 All students are encouraged to serve the school community and lead by Godly example. The King's Academy offers a loving environment where students are encouraged to grow in their relationships with Jesus Christ, their families, teachers, and peers. We strive to partner with parents to bring their children up “in the discipline and instruction of the Lord" (Ephesians 6:4). Our program includes numerous relationship-building opportunities that create a school culture defined by respect, integrity, and love. We believe there is one God, eternally existent in three persons--Father, Son, and Holy Spirit (Genesis 1:1, Matthew 28:19, John 10:30). We believe that God directly created the heavens and the earth and all that lies therein (Genesis 1). We believe in the deity of Christ (John 10:33), His virgin birth (Isaiah 7:14, Matthew 1:23, Luke 1:35), His sinless life (Hebrews 4: 15, 7:26), His miracles (John 2:11), His vicarious and atoning death (1 Corinthians 15:3, Ephesians 1:7, Hebrews 2:9), His Resurrection (John 11:25, 1 Corinthians 15:4), His Ascension to the right hand of God (Mark 16:19), and His personal return in power and glory (Acts 1:11, Revelation 19:11). We believe in the resurrection of both the saved and the lost: they that are saved unto the resurrection of life, and they that are lost unto the resurrection of condemnation (John 5:28–29). We believe in the spiritual unity of believers in our Lord Jesus Christ (Romans 8:9, 1 Corinthians 2:12–13, Galatians 3:26–28). The King's Academy admits students of any race, color, and national and ethnic origin to all the rights, privileges, programs, and activities generally accorded or made available to students at the school. It does not discriminate on the basis of race, color, or national and ethnic origin in administration of its educational policies, admissions policies, scholarship and loan programs, and athletic and other school-administered programs. The King's Academy: The most important part of our school's name is the apostrophe, signifying that we belong to The King, Jesus Christ. Mission, Vision, Values: Download Here!